The Vampire FB 5 is a rank V British jet fighter with a battle rating of 7.7 (AB/SB) and 7.3 (RB). It was introduced in Update 1.33. When using the Vampire, the first thing a pilot should know is that it is inferior in most aspects to its opposition, thus requiring constant vigilance and consciousness of weakness. The Vampire cannot reach the speeds a MiG-9 or an F2H-2 can, it cannot accelerate as well as many of its counterparts and it is appalling in a dive against most of its opponents. So, essentially, the "Vamp" cannot climb well, it can't catch many jets in a straight line and it can't out-accelerate much of its opposition. However, the Vampire has one impressive advantage against its jet-powered opponents: it can turn incredibly well. In fact, a good analogy to flying the Vampire is fighting jets in propeller aircraft. 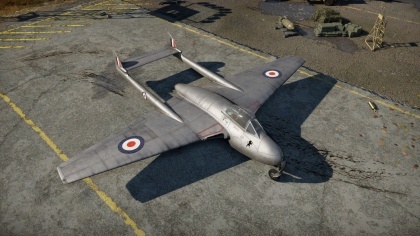 In order to be able to use the de Havilland Vampire's turning power, one should worry about one's energy state. To do such, climbing is important, as is maintaining airspeed. One should never risk being below 400 km/h, since having little speed makes it incredibly hard to evade any attacks by faster aircraft. As such, climbing at speeds above 400 km/h IAS is a healthy option - altitude provides manoeuvring space and more options for manoeuvres, whilst keeping a certain speed means that the pilot is ready at all times to manoeuvre against an enemy. 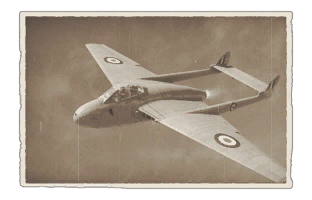 Once an enemy is spotted, gaining speed is the best choice, since the lack of it means the Vampire will become every pilot's nightmare - low, slow and un-manoeuvrable. Its extreme manoeuvrability for a jet means, however, that lining up for a shot is an easy task when an enemy is flying near, and, when an inexperienced or frustrated enemy jet falls into the trap of turning tightly against the Vampire, it will likely end up destroyed. Aiming the guns might be a challenge at first for inexperienced Vampire pilots, since their placement below the centre of gravity makes the Vampire's nose shift downward while firing. Pilots should be aware that turning too much can leave them vulnerable to other enemy aircraft due to the significant loss of speed, so they should never commit to a dogfight if more enemies are lurking nearby.